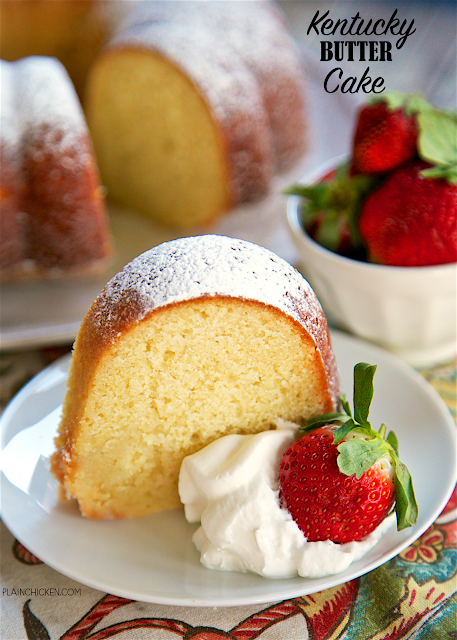 Kentucky Butter Cake - amazing homemade pound cake recipe! SO delicious!!! The cake is soaked with a butter sauce that makes the cake so moist and gives it a nice crust on the outside. Will keep for days, although it didn't last that long at our house! CRAZY good! I've had this Kentucky Butter Cake recipe on my "to-make list" forever. I decided it finally time to test it out with the Kentucky Derby coming up next weekend. OMG! 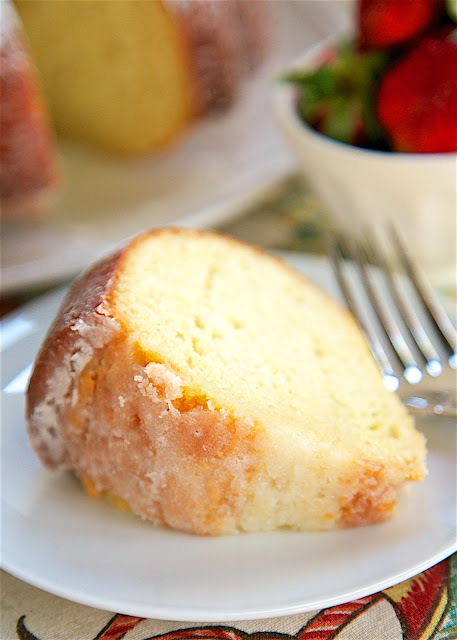 I can't believe I waited so long to try this pound cake. It is SO good. My favorite part? The delicious butter sauce that is poured over the cake when it comes out of the oven. 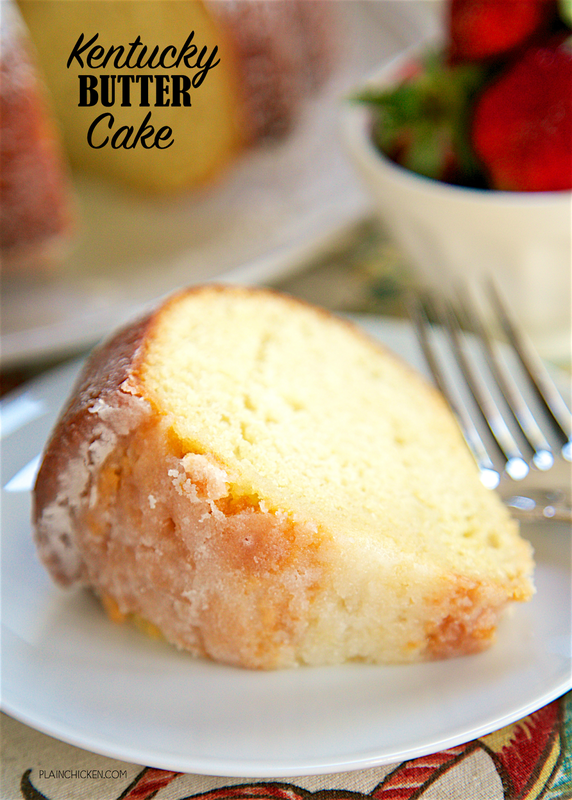 It soaks into the cake and makes it so moist and gives it a nice crust on the outside. This cake is very easy to make and will keep for several days. The one "special" ingredient is buttermilk. It adds great flavor to the cake. If you don't have buttermilk in the fridge, you can make your own. Take a cup of milk and add a tablespoon of lemon juice or vinegar to it. Let it stand for 10 minutes and you will have a good buttermilk substitute. It won't be as thick as regular buttermilk, but it works great in a pinch! Preheat oven to 325 degrees. Grease and flour a 10 inch Bundt pan. In a large bowl, mix together the 1 cup of butter and 2 cups of sugar until light and fluffy. Add the eggs, mixing well. Combine flour, salt, baking powder, and baking soda. Add 1/3 of flour mixture to batter, mix until blended. Add 1/2 of buttermilk and mix until blended. Add 1/3 of flour mixture, mixing until blended. Add remaining buttermilk, mix well. Add remaining flour mixture and 1 tablespoon of vanilla, mix well. Pour batter into prepared pan. Bake in preheated oven for 60 minutes, or until a wooden toothpick inserted into center of cake comes out clean. In a saucepan combine the remaining 3/4 cups sugar, 6 tablespoons butter, 2 teaspoons vanilla, and the water. Cook over medium heat, until fully melted and combined, but do not boil. Prick lots holes all over cake. I used a wooden skewer and went all the way down in the pan. Slowly pour butter sauce over cake. Let cake cool before removing from pan. Holy Moly, that looks delicious! This is a keeper for sure! Just made it today and it is delicious! Also pretty easy to make, thank you! Does it get hard afterwards? Or does it stay soft? A chopstick works well to poke the holes in the cake for the sauce. Where it say white sugar, does that mean powder sugar ? Is the white sugar powder sugar ? So is it a total of 2 3/4 cups of sugar? Why are there 2 separate amounts for sugar? I made a gluten free version of this and it was amazing! I followed the recipe exactly but substituted Cup4cup flour (same amount) instead of regular flour.